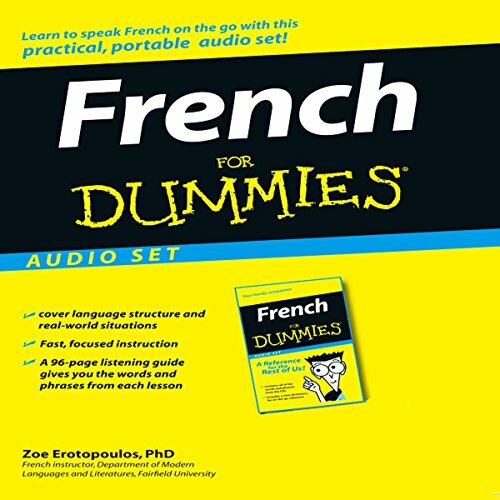 Written by: Zoe Erotopoulos Ph.D.
French for Dummies gives listeners immediate results in a self-paced environment that's customizable for their needs - listening to each lesson from start to finish, or repeating tracks several times, or learning strictly by audio in the car. PLEASE NOTE: When you purchase this title, the accompanying material will be available in your Library section along with the audio. ©2007 Wiley Publishing, Inc. (P)2007 Wiley Publishing, Inc. The nouns are not given genders (le, la, un or une) which makes this book pretty useless for my use if I want to speak French with nouns. I wouldn't recommend this for a true beginner. It doesn't cover any grammar, just words and phrases. It was good as a review of basic words and phrases for me. The material covered was good. One complaint is that the pace is very very slow. They allow too much time between the spoken words. Wonderful way to learn/review French! I love it! I use it at work, while driving when cleaning the house! It has helped me so much, I absolutely recommend French For Dummies! This book is only few minutes long! It's a total rip off. Each chapter last like a minute! Go with other sources, like pimsleur.